The European Chamber of Commerce in Vietnam, better known as EuroCham, is one the principle voices of the business community in Vietnam. The chamber was established in 1998 to help develop Vietnam into an attractive investment destination and trading partner for European business. Since this time, both EuroCham and Vietnam have come a long way. Vietnam now boasts a more liberal economy with a young, outward looking population keen on deeper integration into the global community. In the meantime, we have developed into a fully fledged business association offering a wide range of benefits and services to our members in Vietnam. Despite such achievements, much work remains to ensure Vietnam continues to develop as an attractive place to do business. Acting as an intermediary between our members - the business community - and local, national, regional and European authorities, we lobby on our members' behalf, advocate improvements in the business environment, raise awareness on key issues and disseminate information on doing business in Vietnam and the region. Both local and foreign authorities have recognized EuroCham as a powerful and effective tool for business in Vietnam. We are proud holder of the Prime Minister's Award, presented to the chamber by the Vietnamese government in May 2006, in recognition of our role in helping the development of Vietnam. On October 4, the Ministry of Planning and Investment (MPI) organised a conference in Hanoi to celebrate 30 years of Foreign Direct Investment (FDI) in Vietnam and highlight new strategies and policies for the future. During this conference, the European Chamber of Commerce (EuroCham) was honoured and awarded with a Certificate of Merit by Prime Minister Nguyen Xuan Phuc for its contributions to FDI attraction in Vietnam and the country’s overall economic development and international integration. EuroCham was represented by Mr. Nicolas Audier and Mr. Denis Brunetti, EuroCham Co-Chairmen. EuroCham is the voice of European business striving for an open and fair market environment in Vietnam. We promote European sustainable investment and trade through good corporate citizenship, collaboration and engagement with Vietnamese society. EuroCham is an apolitical, independent and not-for-profit organization. Although we work closely with a number of organizations, in particular the Delegation of the European Commission to Vietnam, we are independent of such bodies and other agencies of the European Union. EuroCham is financed through our membership fees while the remainder of our operational costs are covered through sponsorship, services and projects we provide and undertake. We do not receive funding from any bodies, such as the European Commission. EuroCham is licensed by the Vietnamese government as a business association solely operating for and on behalf of its members and independent of any government and/or governmental organization. Licence N° 08/GP/HHDN-HCM Issued by The People's Committee of Ho Chi Minh City on December 8, 1998 and amended on June 1, 1999 under licence N° 1173/GP-HHDN-HCM and extended on December 9, 2003 under licence N° 22/GP-HHDN-HCM. Hanoi Branch Office Licence N° 26/GP-UB Issued by The People's Committee of Hanoi on July 8, 1999. To help strengthen the voice of the European business community, we have operated in affiliation with a number of European National Business Associations based in Vietnam since 2003. EuroCham’s Country Committees also allow for individuals and companies from EU member states that are not represented by a National Business Association to benefit from EuroCham membership. In December 2005, the Nordic Chamber of Commerce Vietnam (NordCham) (Hanoi chapter) joined as a Country Committee member. Individuals, companies and organisations that join one or more of the above National Business Associations automatically become a member of EuroCham at no additional cost. Individuals, companies and organizations can also join EuroCham directly. More information on joining EuroCham can be found here. EuroCham is governed by 16 Executive Committee members, who are elected at an Annual General Meeting. The Executive Committee establishes the policies and objectives for each year and meets once per month in Hanoi and Ho Chi Minh City. Policies and objectives are then implemented by Directors and staff based in our offices in Hanoi and Ho Chi Minh City. Click here to view the current members of the EuroCham Executive Committee and here to view our Directors and staff. The EuroCham Board of Governors consists of one representative from each of the affiliated National Business Associations and the Chairs of the EuroCham Sector Committees. The Board of Governors drafts recommendations that are, once approved, presented to the relevant authorities highlighting recent issues raised by members of the affiliated National Business Associations and the EuroCham Sector Committees. 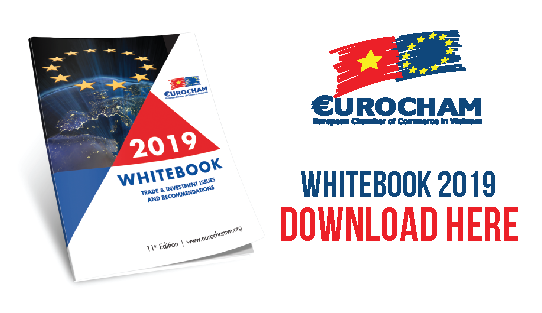 EuroCham is a member of the European Business Organisations (EBO) Network, which works to represent the interests of European business in over 20 countries across the globe. Find out more about the EBO Network by clicking here.